Comments on "On The Street.........Bold Check, Paris"
an interesting picture, makes me ask this question: is this rampant plaid craze only for the boys? or, like early 1990s, also for the girls? I love this look, not only because it is so interesting, but I also frolic in plaid from time to time. Plaid shirts not tucked in with skinny jeans is such a mandatory look for me. 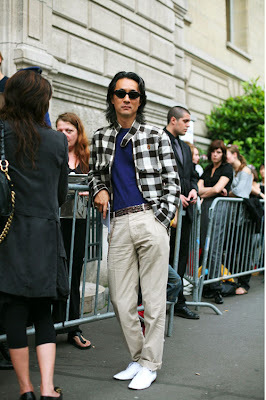 Sartorialist, thank you for bringing us this blog, it is so inspirational. I am in the process of searching for a plaid piece similar to this stylish man's as we speak. Anonymous, I think the plaid shirt is for the boys, as well as the girls. I have seen plenty of girls here in the city, wearing their cute, madras plaid tops and tapered jeans. the coat is great, as is his hair..not sure about the stoid look on his face.. He has that Asian-cool thing going. Yopu know when you see young Japanese teenagers wearing a mish-mash of styles jumbled together but somehow it all works? I don't love the outfit if you were to take it apart but he has the attitude to make it look cool. The thing that bothers me in this picture are the sunglasses.I think he could have chosen wiser.The shoes are a bit too white too. I love the motorcycle style collar on the jacket. there's something disjointed about this ... something in the belt area, but i can't put my finger on it. the shoes save the day though - those are sharp. they bring together his hair and glasses and attitude ... and highlight the frivolity/snappiness of the jacket. I think it's not in NYC, but in Paris, outside the Ann Demeulemeester Men show in July. The plaid check (very American isn't it) is quite a nice AW trend. distractingbut otherwise we wars his clothes well.. I'd like to see his face without the glasses. I recognized the parisian building / architecture and one of the girls in the background is a very efficient girl working at Michele Montagne's press office in paris. Belt + pants combo is from Maison Martin Margiela of this fall '07 season. Looks sweet.